I can understand why someone might ask why I decided to start a new law firm as a solo practitioner in 2016. Before I eventually that question in part 3 of this introductory blog post series, I think some some of the backstory is necessary to establish the foundation for tying all the pieces together. 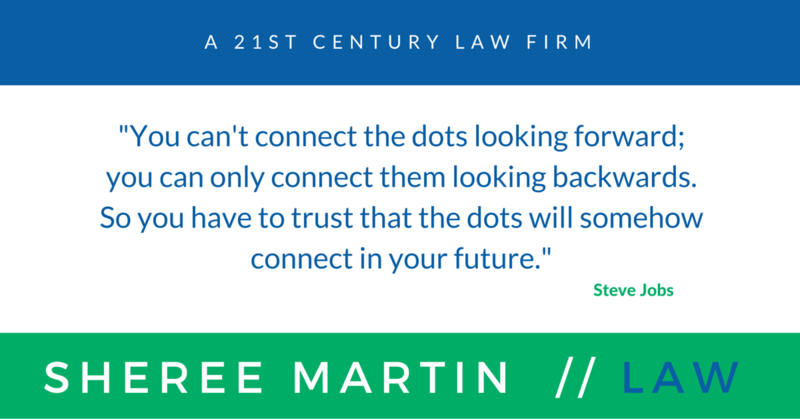 This is part one of a 3-part blog series to introduce my new solo, virtual law practice: Sheree Martin Law. Now that technology makes it much more practical to operate a solo law firm, I can see the dots beginning to connect on ways I can help clients pursue their visions while also serving out my own unique calling. Taken in isolation, my professional journey in the years after law school would appear to consist of a series of detours. As is often the case, first appearances can be deceiving. It’s taken a while, but the dots have started to connect. Many professions and most industries are in the midst of seismic shifts, unlike anything we as a society have experienced before. The profession of law is no exception. If you type the phrase, “lawyer dissatisfaction” into a Google search box you’ll get around 480,000 results. Type in the phrase “lawyers leaving the profession” or “lawyers leaving the legal profession” and you’ll get well over a million results for either variation. In fact, I left the legal profession…..twice….by choice, not so much because I was dissatisfied but because I wanted something more and could not see how I could get to the place I wanted to be at the time while also working full time as a lawyer. So Why Return To Law Practice? The issue of why I would start a law practice after leaving twice, is a fair question to ask. I hope to adequately answer that question in this lengthy 3-part blog series and, as I said, the backstory is relevant to the ultimate answer. In part 3, I specifically explain how and why a return to law practice is consistent with the vision and call I feel led to pursue at this point in my life. Also: I’ve been reading Montaigne’s Essays, so please indulge any digressions. The first time I left law was in August 1997. In late 1994, about a week after my 32nd birthday, I was offered the opportunity to become the first woman shareholder in my firm, Rosen, Cook, Sledge, Davis, Carroll & Jones, P.A. in Tuscaloosa, Alabama. At the time, I had a great business and estate planning practice, pleasant, supportive colleagues, and as good a work environment as one can probably hope for as a lawyer in a firm that has more than one attorney. By 1996, I was starting to feel bored and I could not envision doing the same type of work for another 30 years. At first, I tried enhancing my life outside the daily practice of law. I’d reached the point where I could travel more for pleasure so began taking longer trips, including an annual 3-4 day solo weekend in Gulf Shores specifically to recharge my batteries. I started writing on the side and attending writers conferences. I explored the possibility of taking fencing lessons. [The closest option was in Birmingham, but the time commitment for the commute plus lesson scheduling made it impossible for me to take on that hobby at the time]. I took a graduate course in personnel law in higher ed administration, then signed up for another course in organizational communication. I started playing out with HTML and learning the technical side of website hosting and site management. The reality was that between 1995 and mid-1997, I couldn’t find enough creative outlets in my geographical location to feed my insatiable need for learning and personal growth and the internet in those days was mainly a series of static webpages, plus bulletin boards and message forums for connecting and interacting with others. Here’s the point in the story when I digress briefly to provide some additional contextual color to my story and explain why I might have felt so unsettled, in spite of all the outward markings of success. In law school, I thought my dream choice for a practice focus was communication and entertainment law. I was also interested in environmental law (but not litigation) and transactional work on the corporate side. My electives included courses environmental law, agriculture law, sports law, public and private international law. I had no success in applying to the entertainment-focused boutique LA firms, so I moved on from the idea of doing entertainment law, but thought I could find a good position regionally that gave me the flexibility to settle into the right niche that fit my interests. I ended up taking a summer associate position with a relatively large (for those days), prominent Miami law firm with a diverse range of practice areas. During my summer with the firm, I mainly worked for attorneys in the corporate side, and did a lot of due diligence reviews in Reg D real estate limited partnership deals. I was also given assignments related to insurance defense litigation and those assignments ratified my view that I had no interest in civil litigation as a career focus. When the offers came along in my third year, I opted for corporate securities as my path and accepted an offer from that Miami firm. My car was loaded and I set out for Miami a few hours after the law school graduation ceremonies ended. The memory is vivid. On Monday—after an unexpected weekend snafu with the apartment I’d reserved—I showed up for the first day of work. On our first day, we (the new class of associates) received the news that a significant number of attorneys in the corporate/business divisions had recently left the firm and we would all be doing insurance defense work for the first year or two of our associate careers. I ended up returning my signing bonus and leaving the firm before taking the Florida bar exam. I gave it a few weeks, but my heart wasn’t in it. And a particular incident sealed the deal for me. If you’ve read this far, you probably know that late June is the wrong time of the year to look for jobs in big law firms, especially if you haven’t yet passed a bar exam. So, six weeks after finishing law school, I moved back home with my parents. For this reason—and others I’ll probably blog about later—I call myself the first Millennial. I spent my days studying for the bar exam and agonizing over what I might find to do for work and how to salvage the legal career I’d dreamed of since 8th grade. Potts & Young, a small firm in Florence, Alabama, was kind enough to hire me as an associate, even though I was at the time only admitted to The Florida Bar. To add insult to injury, I missed the deadline to apply to take the Alabama law portion of the Alabama bar exam in February. When I’d called the Alabama State Bar office to begin the registration process, I was given the application due date for individuals who had not yet taken any bar exam. In those days, there was no Bar association website to check the application due dates so I was relying on what I was told when I called the Bar office. I soon discovered, to my surprise, that the application due date for attorneys admitted in other states was a week or so earlier than I’d been told and so I would have to wait until the July bar exam. I hadn’t volunteered that I was already a member of The Florida Bar (it never occurred to me that it would matter), and the person I spoke with hadn’t asked. It’s the unknown unknowns that sometimes trip you up. Anyway, I spent a year as an associate with Potts & Young, being mentored by Frank V. Potts, one of Alabama’s legendary mid-20th century lawyers in the model of Atticus Finch. The lessons I learned from the elder Mr. Potts about professional responsibility, duties to one’s clients, service and generosity toward others were far greater than anything I could ever have learned in a big law firm in Miami. My year at Potts & Young refined my ideas about what it meant to be a lawyer. I mainly did research and legal writing at Potts & Young, since I couldn’t actually practice law in Alabama as a member of The Florida Bar. I knew that I didn’t want to focus on civil litigation, so I considered furthering my education. I’m one of those lifelong learner types and it seemed that an LL.M. could be the ticket to a position that would resonate with my interests. Keep in mind that this was 1988 and there was no commercial internet available to expand my horizons and explore other options. I thought about an LL.M. in environmental law, considered a master’s in journalism, but ultimately decided to go for an LL.M. in Tax Law to up my qualifications to do something other than general civil litigation. I have great respect for full-time litigators and enjoy a lot of the case strategy aspects—but litigation is just not what I want to do professionally on a daily basis. I’d liked the tax law courses I took in law school well enough to consider that field a viable path to my happy life. Environmental law in those days (in my state and region) seemed to be limited to the choice of government work or in large firms. There’s more to the back story building up to how I came to join Rosen, Cook, Sledge, Davis, Carroll & Jones, P.A. in June 1992 but this is probably enough to make it clear that my law career was launched with a major detour that I did not anticipate. Whether my choice to leave the Miami firm before the Bar exam was the right choice is a fair point to debate in the abstract. In any event, that’s all in the past and a moot point today. While in the tax LL.M. program at the University of Florida in Gainesville, I interviewed for several different firm positions in Alabama and a couple of other major southern cities and received two offers, one with a then-Big 8 accounting firm and the other a tax-focused business law firm in Tuscaloosa, Alabama. I accepted the offer from the Tuscaloosa law firm (not the Rosen firm) and started over. The Tuscaloosa firm had about 8-10 lawyers, around 5 shareholders and 3-5 associates, if my memory is correct on the exact configuration when I started. It was a small firm by today’s standards, but the practice management style was very much in the mode of Big Law and the clients included many large business organizations with diverse and sophisticated legal needs. Around the 3 month mark I received my first performance review: The quality of my work was great, I was liked by the firm, but I needed to work more hours. Perhaps I could come in on Sunday afternoon/evenings, as well. I was already working the 7-8 a.m. – 6-7 p.m. weekday grind (with occasional later evenings) and coming in most Saturdays for a half-day. I made it into the Fall. Most nights, I went to bed as soon as I arrived home from work. I had no social life. My long-distance dating relationship with a high-school boyfriend was conducted via telephone and actual letters sent through the USPS. I rarely saw him in person. It was late October, as I recall, when I gave the firm my notice and said I was going to open my own law practice the following January. I said I was happy to work through the end of the year to finish up the projects I was working on. My departure was amicable, but I was kindly told that I could stay two more weeks and that would be as long as I would be needed under the circumstances. I harbored no ill feelings toward the firm. They were good people, good lawyers, doing high-value good work but it just wasn’t a good fit for my personality. So, in November 1989 I moved back home (again) to live with my parents and hang out my shingle as a solo lawyer in Florence, Alabama, and start a new practice limited to matters of business law and estate planning. Remember that earlier “first-Millennial” reference? I’ll skip the details of my 2 years and 7 months as a solo practitioner in that era (December 1989 – May 31, 1992). It is sufficient to note that I had a lot of legal work coming in the door, mostly focused on my desired practice areas, but the overhead was intense. A physical office with a receptionist to answer the phone and greet clients was a necessity. Law books for a tax law practice were beyond expensive. Everything had to be printed and photocopied. You get the idea. One day, out of the blue, I got a call from a tax lawyer acquaintance who said he’d been contacted by a firm in Tuscaloosa (a different one) who was looking for a general tax and business law associate. He wasn’t interested but thought he’d pass the information on to me. I applied, interviewed, loved the firm and accepted an offer. I moved to Tuscaloosa and joined Rosen, Cook, Sledge, Davis, Carroll & Jones, P.A., effective June 1, 1992. ….to borrow a phrase from Sgt. Pepper’s Lonely Heart’s Club Band…. I had aspirations and dreams and could not figure out how to fulfill those dreams while also working full time as a lawyer. Like many lawyers, I aspired to write something other than contracts. I wrote a screenplay based on the story of Esther in the Bible. I submitted the screenplay to a review and feedback session with the guy who wrote the screenplay for Gorillas in the Midst (it was an add-on program through the Jackson Hole Writer’s Conference). His feedback was positive, especially about how I wrote dialogue. I wrote freelance articles. I wrote a very bad one-act play. I started to work on a novel. I tried a reduced time arrangement with my firm to give me freedom to write in the early morning hours. I also tried making a lateral career shift, and applied for corporation communications roles in house, where I could combine my law practice expertise with my general knowledge of strategic communication. To the extent I got a substantive response from those applications, I was always told I was either over-qualified or under-qualified. Ultimately, based on advice of a graduate faculty member whom I’d consulted about getting master’s degree in journalism or PR, in 1997, I enrolled in a Ph.D. program to shore up my organizational communications credentials. I didn’t make the decision to take the plunge and go back to school until July 1997, while I was at the Jackson Hole Writer’s Conference. I felt an intense desire to focus on writing and communication. I had no idea how to make a living and the offer of a graduate stipend, as a bit of a safety net, while taking classes and writing seemed like a viable transitional path to a new career. My plan when I returned to grad school was to get better prepared do organizational communications consulting and leadership training, while also doing freelance writing and working on the novel. I ended up, almost accidentally, taking a job in academia as I finished my Ph.D. Around the time I finished my coursework, the dot com bubble burst, my freelance writing started to dry up, and the September 2001 terrorist attacks left us all reevaluating our place in the world. In March 2003 I accepted a job offer as an assistant professor in the broadcast sequence, School of Journalism and Broadcasting, at Oklahoma State University and moved to Stillwater a few months later. Academia wasn’t the career path I’d anticipated, but I enjoyed teaching and research—even though I didn’t have the research agenda that some grad students had, because I’d spent my time writing articles learning internet technology, rather than cranking out social science studies testing various hypotheses using undergraduate students assigned to various experimental conditions. I moved to Stillwater at the end of July 2003 with the intention of building a career there, getting tenure, and making Oklahoma my home. Just as I’d experienced with Rosen, Cook, Sledge, et al, I had great colleagues in the School of Journalism and Broadcasting, friendly and supportive. One of the key courses I was hired to teach was a mass communication theory course for master’s students. I loved teaching that course and loved working with the graduate students. I was also a back-up teacher of mass media law, covering a section of the course at the OSU-Tulsa campus, with graduate and undergraduate students. The first year was a bit stressful because I was learning the ropes of how academia works from an employee/faculty perspective. Academia is slightly more bureaucratic than, say, a 12-20 lawyer firm, so that was an adjustment (understatement). In that first year, I also had to complete my dissertation research and then write and defend my work. I didn’t get much of that done until well into my second semester, because a lot of the data I needed was only available in a couple of libraries–the closest and most accessible of which was the Chicago Public Library. What I needed was too comprehensive to get through interlibrary loan. Needless to say, by the time I successfully defended my dissertation in August 2004, I was exhausted. I was also a bit more free to develop social contacts in the community (something I’d really tried to do in my first semester, but less so in the second, due to dissertation). That’s when I began to realize that Stillwater wasn’t an ideal place to be a single adult female. At that time, I still thought marriage (and, likely, even a child) was a possibility. The next two years in Stillwater were overall positive but I was thinking it less likely that I would spend my academic career at Oklahoma State. I successfully made it through the third-year review, with unanimous recommendations for reappointment by all of the various committees and administrators who had a say in the matter. In my third year, I had quietly started looking for a new academic appointment that would let me leave Oklahoma State and move up in my academic career trajectory. In early 2006, I received an offer for a position at Texas Christian University, in the broadcast department, of the School of Communication. Had I taken the job, I would have moved to Ft. Worth and started teaching at TCU in the Fall of 2006. Based on a gut feeling that something wasn’t a good fit for me, I turned down the offer. My search in 2006 and early 2007 didn’t yield much fruit. I had a couple of phone interviews, but nothing seemed to be a fit. I turned down two campus visits that resulted from those phone interviews. The 2006-07 school year ended and I had nothing on the horizon. I happened upon a late season announcement for a legal writing position at a law school in Mississippi and contacted Sydney Cook at my old firm to see if he would serve as a reference for my application for that position. That phone conversation led to the next major detour in my professional career. That’s where I’ll pick up in part 2 of this series. Free newsletter with articles, tips and more.